Escape to our renovated farmhouse for family fun or a peaceful get-away. Beds for 8 but floor space to add air mattresses putting max occupancy to 10 adults or 12 with kids. One full bath with shower and jacuzzi tub upstairs; another bathroom with shower in the basement (perfect for washing off after a day outside!) and a powder room off the living room. A/C in each bedroom (no a/c on main floor). There are two large stone firepaces; huge yard; spring-fed pond perfect for swimming, wading, fishing, or relaxing in the shade of a tree (stocked with Smallmouth Bass, Catfish and Blue Gill); creeks for exploring and splashing; huge front porch perfect for coffee or family dinners; and a fire-pit in the back yard for roasting hot dogs and s'mores. Gas grill available (summer). Wifi available (limited); Large screen TV for use with the DVD/VCR player (no TV service/cable). Conveniently located off Rt. 281 only minutes to Confluence, Ohiopyle or to Rt. 40 (National Pike). We are the Riley family (6 of us!). This wonderful home is our way to get away from it all and spend quality time with each other. In the summer, we spend our time at the pond swimming, fishing, or floating in a raft; we play frisbee and ball in the big yard; or just playing in the creek. We go white water rafting on the Yough River and hike or bike in and around Ohiopyle and Confluence. In the evenings, we sit around the fire and roast marshmallows while the kids play "Ghosts in the Graveyard" and run around with glow sticks. In winter, we put a big fire in the stone fireplace and play board games and cards, and watch movies. Outside we build snowmen and big forts. As our kids are getting older, we can't spend as much time there anymore, so we want others to be able to enjoy this slice of heaven! The large front porch....enjoy coffee in the morning with a good book then later enjoy dinner there with your family and friends. Listen to the sounds of the creeks as you take in the peacefulness. The huge yard is great for the kids while others may spend their time fishing in the stocked pond, reading in the shade of a tree or splashing in the creeks. We especially love the large stone fireplace in the winter. We spend hours there reading, playing games or watching movies together. toilet, shower, perfect for rinsing off the day! Private 10 acre lot with a large front and back yard, pond, and woods for exploring. Window a/c in each bedroom (seasonal); No a/c on main level. Basic Wifi available through Hughes Net (no streaming/downloading, etc.). Standard drip coffee maker. Filters provided. Basic pantry items provided: paper towels/salt/pepper/sugar/oil/various herbs & spices. Seating for 6 but can add more chairs for 8. Seating at kitchen island for 3. Large TV for use with DVD/VCR player (no cable). Huge front and back yards. Several lawn chairs available to use around the fire pit or at the pond. A few life jackets are available for your use. Use at your own risk. Beautiful farmhouse, very relaxing and serene, the fireplace was the highlight of our week! We spent the week before Christmas at the farmhouse, two couples and two dogs. The house was updated and beautiful, and there was plenty of firewood for daily fires in the great room, and a wide selection of games and DVDs to choose from. Most restaurants and local shoppes were closed for season, but we checked Fallingwater and Kentuck Knob off our bucket list. Both are close-by, and truly spectacular. Shelley was very responsive and helpful during our stay. We highly recommend this vacation spot! Our weekend stay at Shelley's home was wonderful! The house has so much character and is updated with all the amenities you need. 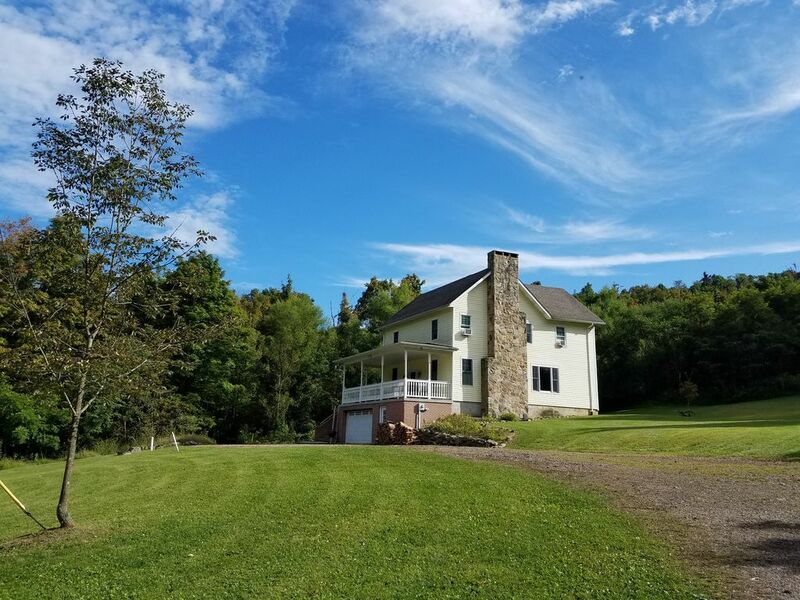 The house sits on a beautiful setting - so secluded, yet not too far from Ohiopyle for some fun. Shelley went above and beyond to make sure our stay was enjoyable. She was available at any time for questions and she even made sure we had the proper information for water levels for our rafting trip. There were games for the kids and a firepit for roasting marshmallows and hot dogs, as well as a huge bin of outdoor toys. The kids were occupied and having fun so the adults could enjoy the scenery and some time together. Thank you again for a fantastic weekend getaway!! We loved it! We had an amazing time! My husband & I came from Colorado & invited our family from Pittsburgh & Maine for a week. We had up to 8 or 9 adults & 2 little kids at one point, & everyone that visited loved the home & its location. It is easy to get to from the Pittsburgh airport, & there is a lot to do nearby. We rented a boat from the Yough Lake Marina for 5 days & that was awesome. We also played golf at a local 9-hole course, hiked at Ohiopyle State Park, visited the Laurel Caverns, played board games, watched a movie or two, had a few fires in the fire pit, grilled on the grill, spent LOTS of time on the front porch (from morning coffee to family dinner & dessert), played in the pond & the creek, camped in the yard, walked down to the campground (where they have a nice playground! ), did some stargazing...it was great. Don't pay much attention to the weather forecast. When we were there, it changed daily, & when there was a chance of rain, it either didn't rain or rained in the late afternoon, after we returned from hikes or boat rides. And the rain quickly passed & was nice to watch from the front porch. Shelley is a super host, too. She was very easy to get a hold of & replied in a timely manner, & was very helpful with answering questions. The house is well-stocked with kitchen supplies & we had everything we needed for a family get-together for the week! We met at the farm house for a reunion of friends and had a great stay. The house easily accommodated everyone and the spacious and secluded yard was ideal for spending time in. It was a quick drive to ohiopyle for our rafting trip. I will definitely stay here again for our next trip! We thoroughly enjoyed our stay here and it’s location close to Ohiopyle State Park. The outside space, the pond, and canoe were highlights. Just had two issues, there was a sulfur smell/taste to the water which is quite common for well water and bringing a water filter with you should help. Also there were some bats in the house probably due to an open chimney flue. Since we like bats and their amazing bug control it wasn’t a big problem and it gave us an opportunity to use our pillow fort building skills in front of the fireplace. We had a great time playing the MANY board games at the house including some good multigeneration games. We also shared the house with another family and there was plenty of kitchen and bathroom space for the 4 adults and 5 teens to feel comfortable. Beautiful property that is very well taken care of. Shelley was great with communication. We'll be back!! Only minutes from Ohiopyle (20) or Confluence (10). Enjoy white water rafting, canoeing, kayaking, hiking, biking (mountain biking or on the flat rail trail). The Allegheny Passage Bike Trail is only 5 miles away by car. Stop in and eat at Lucky Dog after your ride or get ice cream at Outflow; Visit the beach at Youghigheny Lake and Dam or head to the marina in Addison and rent a boat. Fish at our spring-fed pond or jump in and relax. Nemacolin is only 15 minutes away offering golf, restaurants, spa and wildlife. Middle Creek golf course is 30 minutes away; Other places worth visiting: Fort Necessity National Battlefield (20 min), 911 Memorial in Somerset (45 min), Frank Lloyd Wright's Falling Water (30 min) and Kentuck Knob (25 min). During the winter, Hidden Valley, Seven Springs, and Wisp Resorts are only 40-50 minutes away. Ohiopyle state park offers a sledding hill with a warming hut just off Sugar Loaf Road (8 min). -Tax includes PA 6% sales tax and 5% local Fayette County tax. -This is a NON-SMOKING house. -Dogs are allowed only with owner approval. $25 per night; $100 per week (over 4 nights). Not informing us of your pet will result in a $100 per night fee.Other pet requirements provided after approval (vaccinations/preventives, etc). -No rentals to anyone under the age of 25. - No parties or large events - Rental agreement must be signed and returned to owner at time of booking. -Maximum overnight guests is limited to 10 adults or 12 if there are children. There are actual beds for 8. Any event involving more than 10 people must be approved by the owner in advance. Failure to do this will result in an extra cleaning fees. -PHONE-Landline phone available for local and emergency (911) calls only. -WI-Fi-Available but limited (no streaming). Information provided upon request. - TV for use with DVD/VCR player (provided). No cable or satellite.